Pour the Rice Chex™ cereal in a large bowl and set aside. In a small bowl, mix together the powdered sugar, sugar and cinnamon. Set aside. Using a double boiler, combine and melt the cinnamon chips and butter. After the butter and cinnamon mixture has melted, pour it over the cereal. Stir it well to evenly distribute the mixture. Pour the sugar and cinnamon mixture over the cereal. Stir and make sure to coat all of the cereal. Pour the coated cereal on the prepared baking sheet and let cool for 15 minutes before serving. Do you look forward to churros at the state fair or at carnivals? I don’t believe I ever left a carnival without indulging in one. Those long cinnamon-y sticks of goodness were too heavenly to not have one! You know what I’m talking about, yes? Luckily, for those of us who don’t want to whip out the deep fryers to make churros, here is an easy option to satisfy that craving! 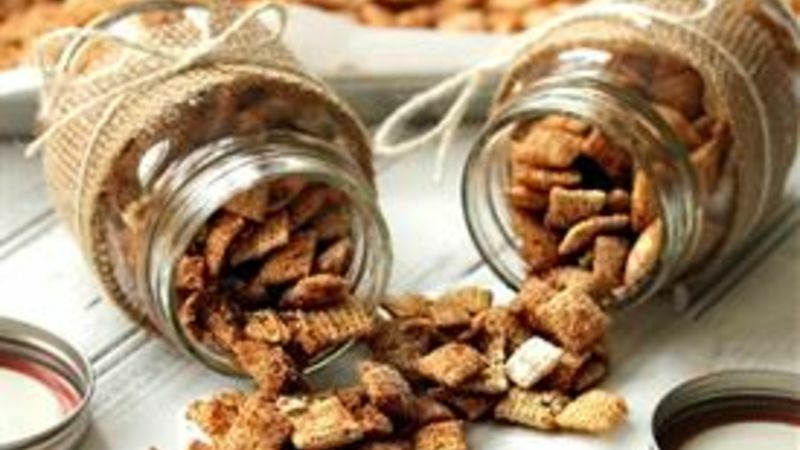 Make Churro Chex Mix! What’s that, you ask? It’s an adaptation to the ever-so-popular puppy chow snack! Churro chow is the perfect addition for a get together, party, study session or for just a snack. You can make a HUGE batch of it – and I mean HUGE – then you will always have it around to munch on. It’s addicting, so maybe you won’t have it around forever. Let’s grab the ingredients! Butter, cinnamon, cinnamon chips, powdered sugar and sugar. Next you’ll want to melt the cinnamon chips and butter together using a double boiler on the stove. Mix, mix, mix! It should start melting into a tannish mixture soon! In a separate small bowl, mix together the powdered sugar and cinnamon. Once the cinnamon butter mixture has completely melted, pour it over your huge bowl of cereal. Then dump in your powdered sugar mixture. Pour all the contents onto a large baking sheet lined with parchment paper. Let cool for 15 minutes and then gobble it up!